One cannot be in Cappadocia and not go for a hike. Well, not in our case away. As avid hikers, we are always on the lookout for cool and interesting trails and the perspective of hiking the Rose Valley was something we could not pass. 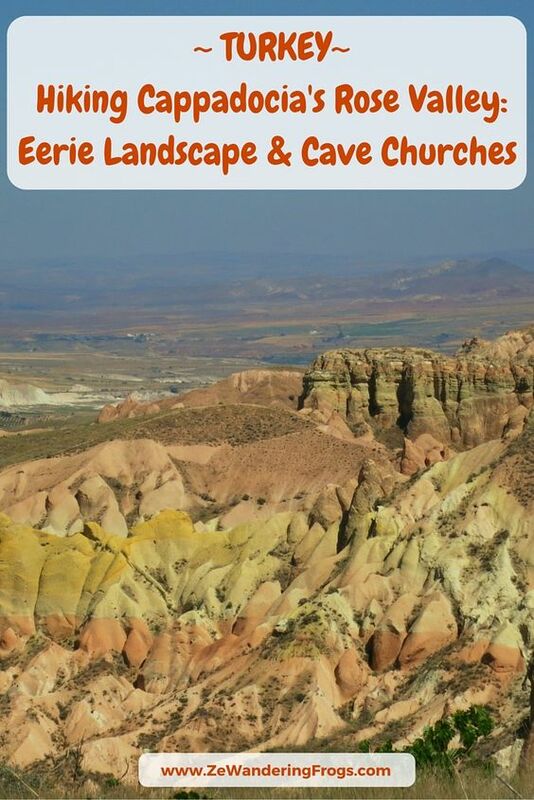 Sometime called the Pink Valley, the Rose Valley sits between the Göreme and Çavuşin villages. A large valley cut in by smaller ones, it’s aptly named after the color of its rocks. The warm hues vary constantly, depending on the time of day, season and weather, and making the area a photographer’s paradise. Hiking through the valley is not only the chance of admiring amazing landscape, but also to go through history, with a trove of cave churches and houses dating back hundreds of centuries ago. The Rose Valley offers hiking options for all levels, from easy to difficult, and an average 2 to 3-hour hike (3 miles / 4.5 km). The valley is divided into two main trails – Güllüdere I and Güllüdere II, linking Aktepe Hill (Sunset Point or Panoramic Viewpoint) north of Ortahisar up to Çavuşin about 4 to 5 km away depending on the trail taken. Both trails depart from a stone marker just after stepping in from Aktepe Hill, both offer side access to cave churches along the way. Güllüdere I had our preference though as it also offers some of the best views, whereas Güllüdere II stays lower in the valley. The stone marker actually lists a third trail, the shortest trail to Çavuşin with just barely 4,164 m, but this is also the one with the less churches and few views. Speed over history. Going along Güllüdere I, we went through gently rolling paths carved along hoodoo-like sculptures, reaching up some plateaux with endless views of the Rose Valley and deep into the landscape of Cappadocia. The rocks are made of consolidated volcanic ash, or tuf, which make them both soft to carve but rough under the touch. We were glad we had started the hike relatively early as the day was getting hotter by the minutes. June, together with July and August, has full-summer temperatures and it can be scorching hot during the afternoon – not recommended for hiking. We arrived shortly to one of the better known cave churches around – Hacli Church. Known as the Hacli Kilise or Church with the Cross. The Cross Church is now easily accessible by a flight of stairs, a much safer option than its original setting once very difficult to get into. Taking its name from a huge cross on the ceiling, historians think this was carved sometime in the seventh century, while the current colorful frescoes are estimated to date from the 10th century. As you are entering the church, nothing prepares you for the delicate artworks, amazed to find such detailed paintings in such a bare moon-like landscape. Standing here, admiring the frescoes and thinking about the dedications of believers past in the silence of the valley was truly a spiritual experience. Hacli Church is sometime mistaken for Üç Haçlı Kilise, The Church with the Three Crosses, which is also in the surrounding valley. Thanks to the popularity and location of the Hacli Church on the trail, the cafe is now available at the bottom of the Church, offering a welcome rest into our morning for thirsty hikers like us. Even with the temperatures becoming increasingly hotter, I decided for a hot sweet tea. Seated under a small lounge area fitted with comfortable pillows and shaded by fleeting curtains, we savored that short break while savoring the surrounding scenery. Carrying over our hike, we reached a higher plateau, with sweeping views of the Valley. We were the only ones of the trail, making the moment very special. With 360-degree views, we felt we were alone in the world. Too soon we had to head towards the end of the trail but not before we descended into a steep and narrow gully. With tuf being so fragile, it can turn into small sand like gravel, which made the descend rather tricky. Luckily ropes were readily available, helping hikers to keep their pace and position steady. I could not imagine hiking this part under a rainy day, it would have turned the area quite interesting. This was the last hilly section before reaching the actual valley floor, where we started to see some farmed fields, habitations and an old cemetery. We were back to civilization. Having a guide was great as we had no map of the area. As I was writing this blog, and researching for maps to share, it became very clear that there is no real official map available (or that I could find of). The Avanos Vadileri (managing the project to develop trekking around thr Avanos Valleys) is definitely working on developing hiking in the region and we did come across nice distance signs while we were hiking. One can only assume that future development will include more comprehensive maps for the independent travelers not relying on guides. Want to read more about Turkey? Check our posts about Hot Air Balloon in Cappadocia, tasting traditional Turkish cuisine, walking down history in Ephesus, or watching the Whirling Dervishes Ceremony. Sign-up to our newsletter to receive the new posts on our adventures on our round-the-world trip! Thanks for sharing your nice picture . Cappadocia is pretty special! And the history is really interesting too. Have been planning for a trip to Turkey for quite some time, will love to include this hike when that happens. The terrain looks so different and fascinating. Thanks for sharing this lovely post. They are so many different hiking options around Cappadocia, I wish we would have had even longer time to explore! I’m not much of a hiker (want to change that!) but this sounds like a treat! Those views across the valley must have made sweating in the heat all worth it! It’s always the trick, the views and experience make each hike worth it, regardless of much effort it takes. Whoa, that landscape is different! I love the color. This post is so helpful. I love how thorough you were. The colors changed during the day, with the sun adding more contrasts through the different shades. Really awesome! Seems like a nice trail. Would love to see those frescos in detail. The cave churches were a surprise for sure. I was not expecting to find them on the trail, and some of the designs were really exquisite! REALLY want to go there. Before, it was just for the balloon ride. Thanks for pointing out something more. We did the hot air balloon early the day before and the hike on the second day. It was great to experience on the ground and take in the scenery. This hike sounds fantastic! We have added it to our must do! Agree, Cappadocia is stunning, and the hikes were mindblowing!